Boasting the "best Chai west of the Andes," this art gallery/coffee shop/bar in one, has it all. I'm a big Chai-lover, but really like Mocha Java's Vanilla Chai (in Victoria Ward). How was Manifest's? 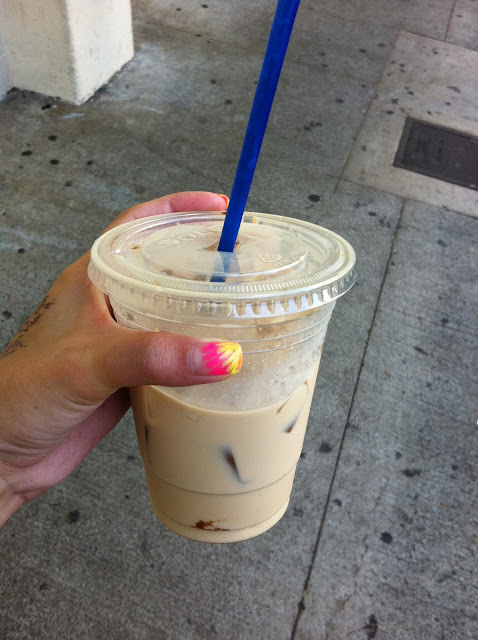 It was a very hot day out, and usually I like my Chai hot, but decided on Iced Chai. It was tasty, plus it had to be legit, they use Chai powder. They also serve 100% Waialua coffee that's locally roasted. "It's local so you know it's good," is their slogan. You can also bring your laptop (if you prefer a different atmosphere from Starbucks)- they offer free wifi and are open at 8am! It was funny and bizarre (at the same time) to see this place in the middle of the day with only a few customers enjoying coffee drinks. Quite a difference from the First Fridays shenanigans, when the place is jam-packed, and you're wondering if the place has AC because the place feels like an oven, and everyone is ordering vodka shots. Hours: M-F 8am-2am, Sat 11am-2am.